A combination of art events and holiday festivities ensures there is something for everyone. The Chickasha Festival of Light holds its opening ceremonies November 22nd beginning at 6 p.m. at the Shannon Springs Park Amphitheatre. Traffic to the park opens at 7 p.m. The Festival of Light is an annual event that began in 1993. It now spans the 43-acre Chickasha park, with over 4 miles of lighted sidewalk. The Crystal Bridge, one of the main walking route attractions in the park, alone is covered in 75,000 lights. 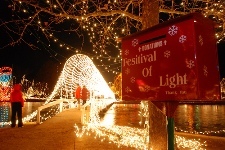 The Festival of Light has won several awards over the years, including Event of the Year from the Oklahoma Department of Tourism in 1995. The Chickasha Festival of Light is open through December 31st. Lyric Theatre of Oklahoma's Thelma Gaylord Academy celebrates its 10 year anniversary with a limited run production of CATS. November 17th through the 19th, academy students, ranging in age from 7 to 18, perform the famous musical from 1981 on Lyric’s Plaza Theatre stage. Loosely based off T.S. Eliot’s “Old Possum’s Book of Practical Cats,” CATS features music composed by Andrew Lloyd Webber. CATS won the Oliver Award for Best Musical in 1981, and the same Tony Award in 1983. CATS ran on Broadway from 1982 until 2000, making it the second longest-running show in Broadway history. The Oklahoma City Museum of Art screens director Constance Marks‘s “Being Elmo” November 17th through the 19th. The documentary revolves around Kevin Clash, the man who has provided the voice and personality of the Sesame Street character since 1985. “Being Elmo” premiered at the Sundance Film Festival in January of this year, and was awarded a Special Jury Prize in Documentary. Narrated by Whoopi Goldberg, the film features interviews from Frank Oz, Rosie O’Donnell, and Cheryl Henson, and provides a special look at Sesame Street and the Jim Henson Workshop. The Fred Jones Junior Museum of Art on the University of Oklahoma campus in Norman hosts a Family Day on Sunday, November 20th from 1:00 to 4:00 p.m. The theme “Taos Time: Art of the American Southwest from the Adkins Collection” focuses on the recently reinstalled exhibit in the newly constructed Stuart Wing. Hands-on art activities, such as creating clay animals and mixed media collages, take place in the Dee Dee and Jon R. Stuart Classroom. There will also be an interactive media guide for the Native American pottery portion of the exhibit. The event is open to the public. Other events you may be interested in include the “Breaking Dawn” Wedding Reception at Del City Library, downtown Devon Ice Rink opening, and the last Ghost of Fort Reno Tour in El Reno. For details and more events over the next week, visit our calendar page.